Essential reading not only for interview preparation but for defining yourself. Questions divided from classic to creative, with 10 tech-specific questions. Great value for IEPs/ITAs who struggle with North American business communication. WANT the honest truth about executive recruiting? Your designation gets you in the door, your character keeps you in the room. Those are the facts in accounting and finance today, when employers assume that anyone with a CPA designation can handle the numbers but the highly sought skills are all intangible: experience, presentation, leadership and sound judgment. How you perform in an interview — not what’s on your resumé — determines whether or not you get the job. Why You? 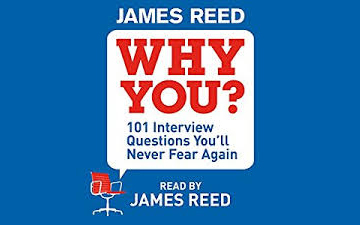 101 Interview Questions You’ll Never Fear Again, by James Reed, can help prepare you for that performance. The latest (2017) edition now includes a bonus chapter of 10 extra questions perfect for CPAs in the technology industry, from the simple (How do you keep up with new technology in this industry?) to the esoteric (If you were a tech brand, which one would you be and why?). The questions are divided into five categories of roughly 20 questions each: Classic, Career Goal, Character, Competency, and Curveball and Creativity questions. Other chapters include explorations of the recruitment process, the right mindset for interviews, and how to begin and end an interview. Why You? begins as it should, with the most common interview question of them all, the icebreaker, Tell me about yourself. It then divides each question into two categories: “the real question” (what the question is really about) and a “top-line tactic” (the strategic approach to the question). The simplicity of a classic question like Tell me about yourself is what makes it answer so complicated — there are several ways to answer the question. Why You? should be essential reading for any internationally educated professional who struggles with North American business communication. It’s a common complaint amongst new Canadians that recruiters ignore resumés and focus on personality, which is difficult to convey when you struggle with the nuances of the English language. Why you? can be a useful resource for practising interview skills. Finally, what makes Why you? so valuable is the reflection it demands of you. So many of these interview questions can help you to define yourself as a person — your goals, priorities and passions — as well as the particular value proposition you can bring to any employer. Essential reading for all professionals.